Oh, are two killer twins after you? With axes? Because that is a horrifyingly specific weapon to use in this day and age. Do they have you cornered in a parking lot? After a peaceful day of shopping, no less? How awful. Oh there you go, you killed one with your car. 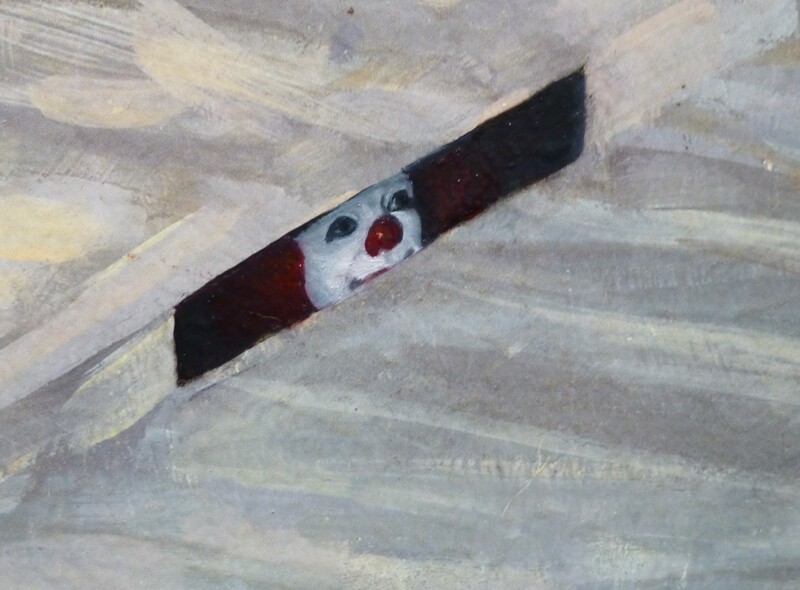 Is the other twin bearing down on you, slowly, axe raised as you fumble for your gun? How very stressful. You deserve a nice chilled vodka, my friend. Then I suggest you break the bottle over the bumper of your Jeep Commando and prepare to fight. The idea of “repurposing” — taking something old and giving it a new life — is an exciting concept that creates a world of possibilities. 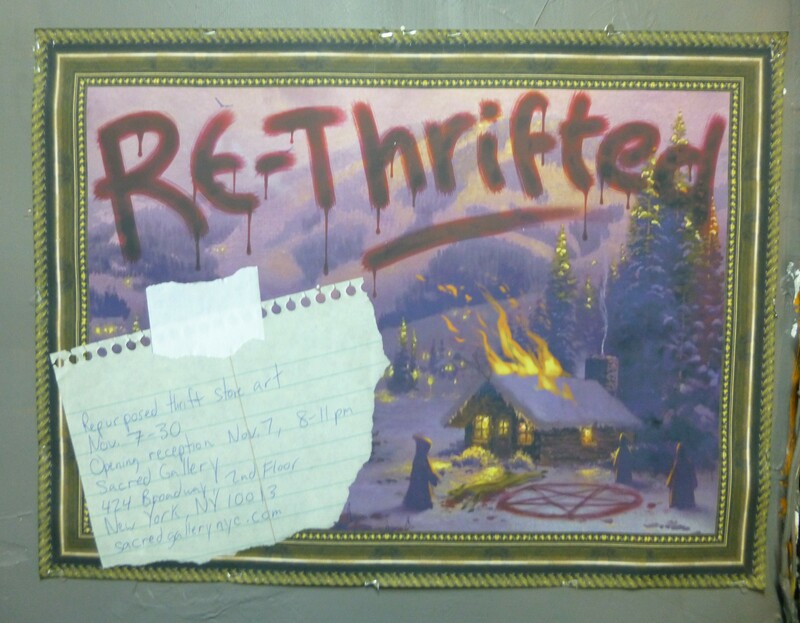 Sacred Gallery explores those possibilities (with an inclination towards the darker side of imagination and reality) with a highly amusing new group exhibit entitled Re-Thrifted. To create Re-Thrifted more than two dozen artists started with Thrift Store art finds and recreated the original piece as a new work of art. 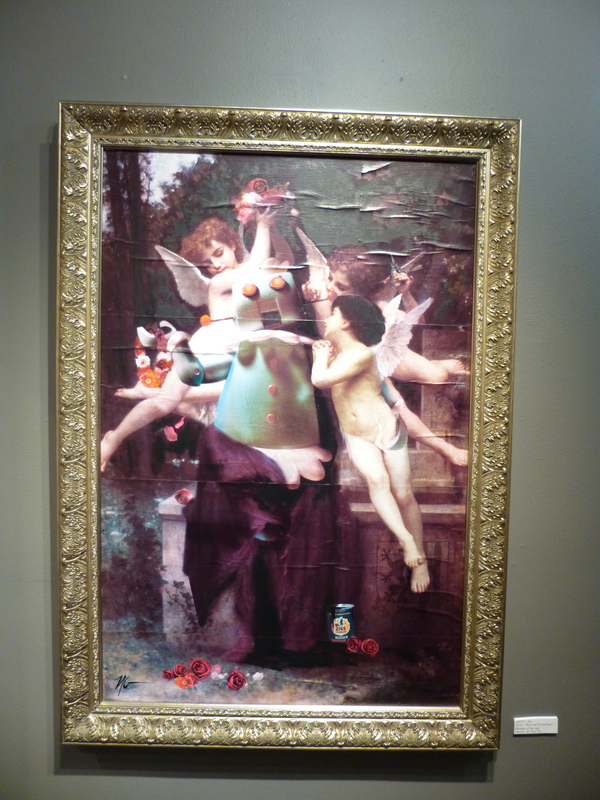 There are both paintings and sculptures in the exhibit and it was so much fun to view the show and compare the new artworks to their more humble beginnings, as many of the pieces are hung alongside tiny prints showing the pieces that inspired their genesis. 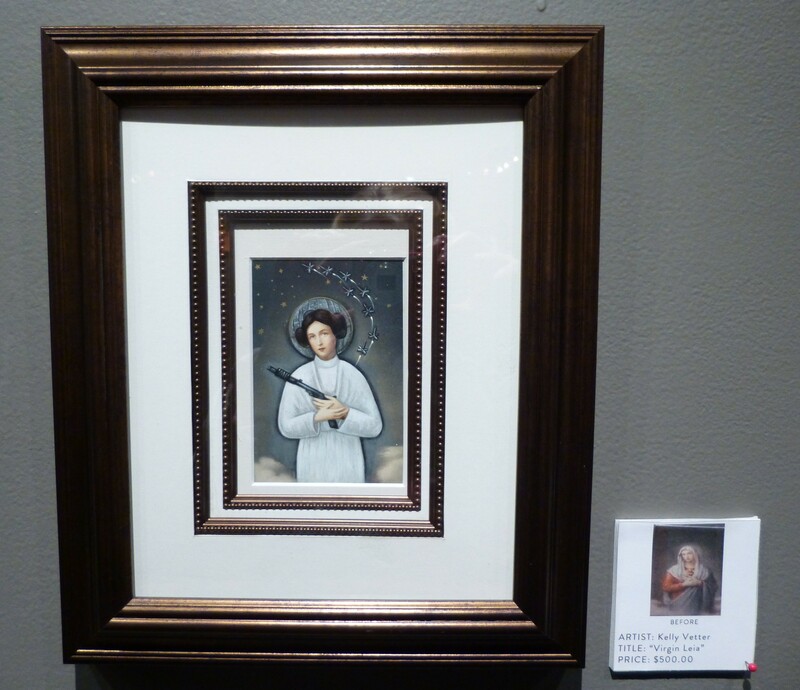 An excellent example of this type of work in its simplest form is Virgin Leia, a kitschy painting of the Virgin Mary recreated as a portrait of Princess Leia from Star Wars. Appropriate! Above, a group of picnicking Renaissance children become flesh-eating members of the Undead. 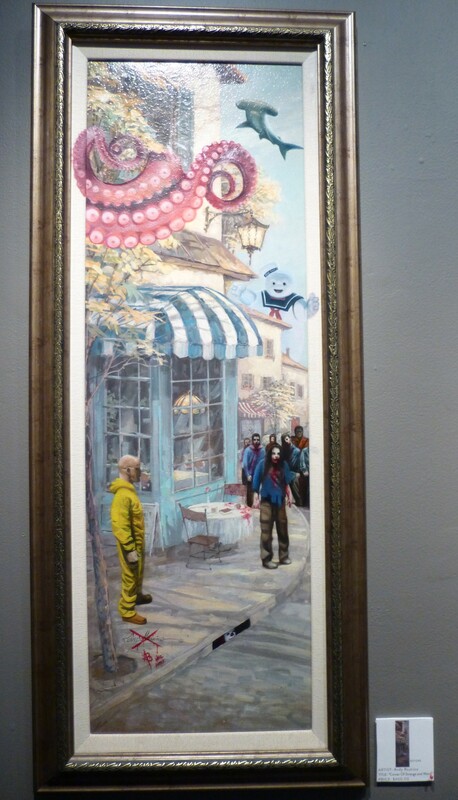 The painting above features a picturesque Parisian Street Cafe that has been infused with images from pop culture, turning it into a surreal nightmare. 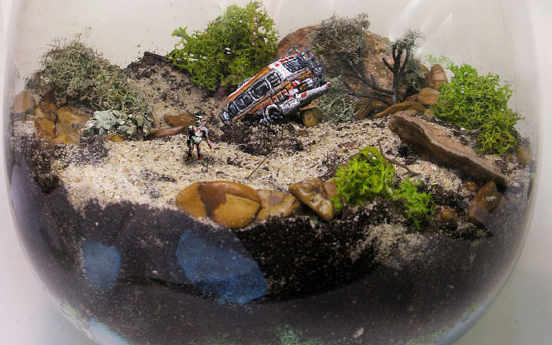 Check out some of the cool details from this work in the shots below. 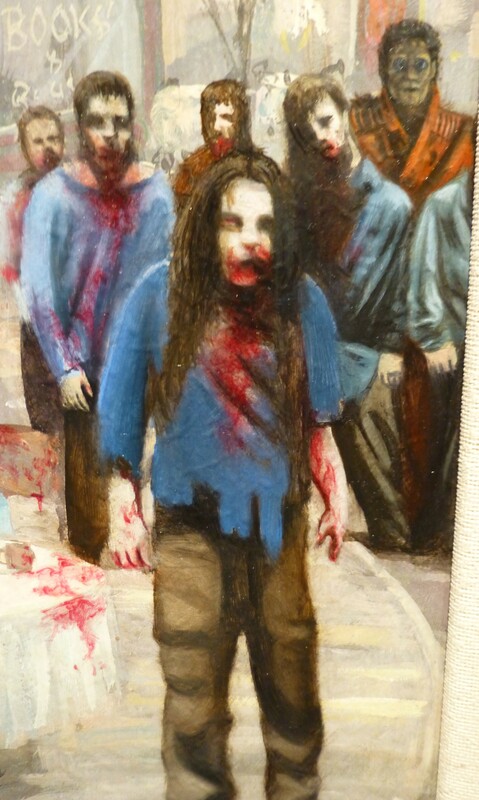 Note that this Herd of Zombies includes Michael Jackson as he appeared in the Video for “Thriller.” So clever! 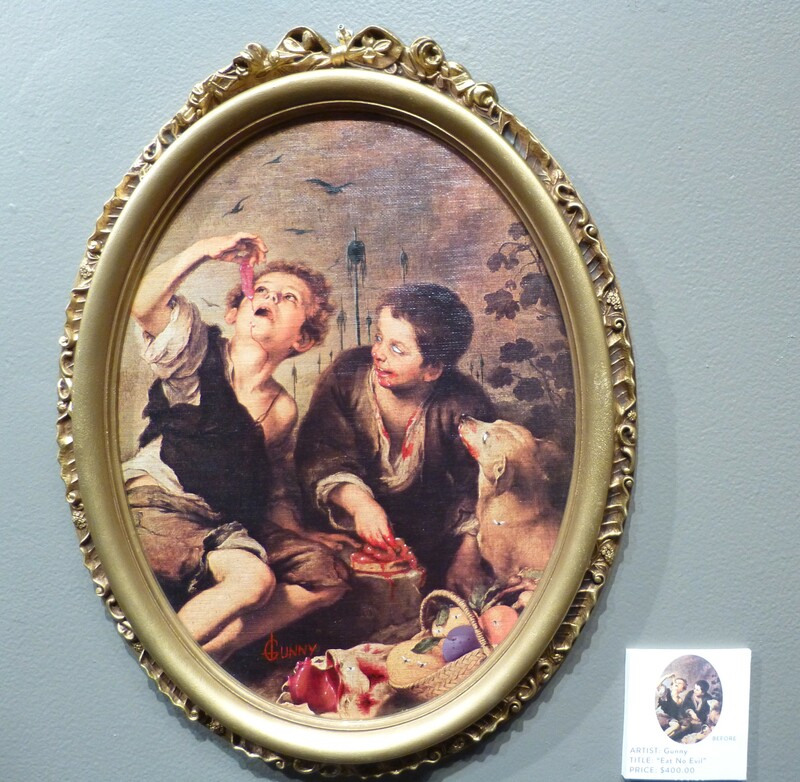 If this awesome painting wasn’t already sold I would have snapped it up in a heartbeat! 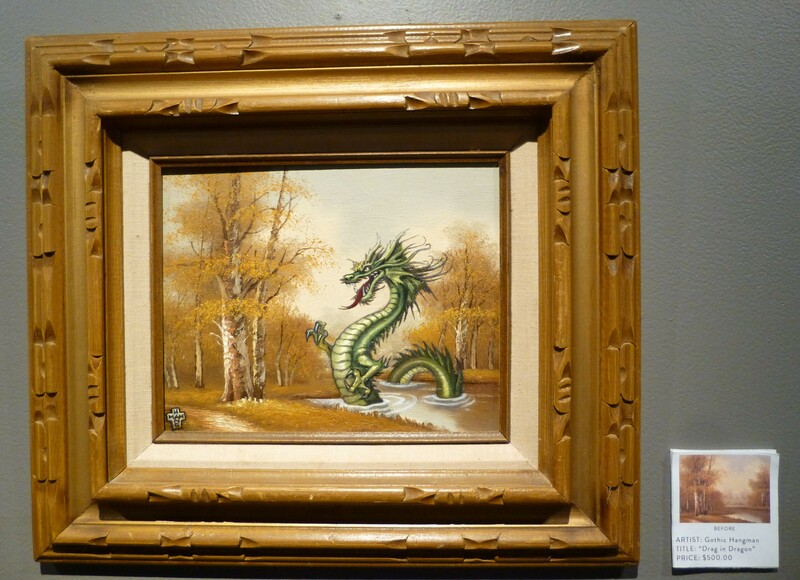 A menacing, medieval Dragon invades an otherwise idyllic forest scene in this painting by the artist Gothic Hangman. You can tell that the participating artists were very inspired and that everybody had a blast creating their art for Re-Thrifted. 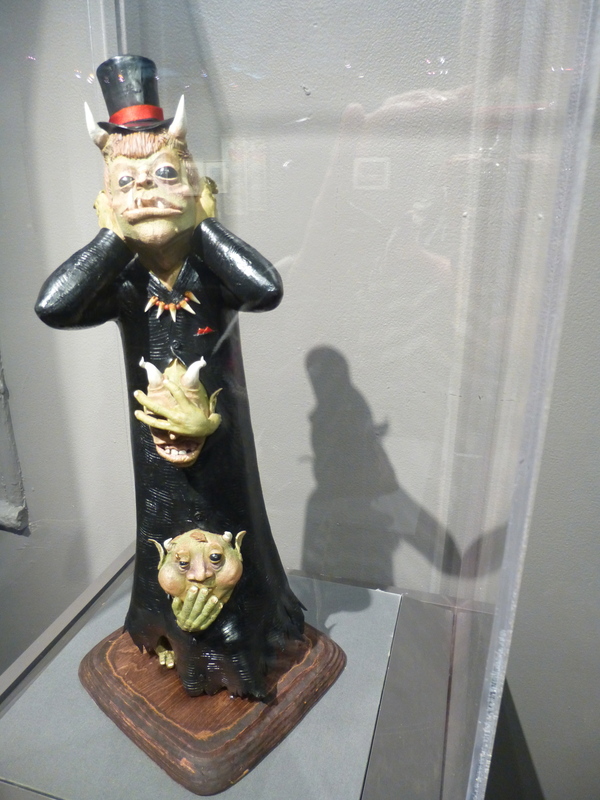 Kudos to Kevin Wilson at Sacred Gallery for hosting yet another very cool show! 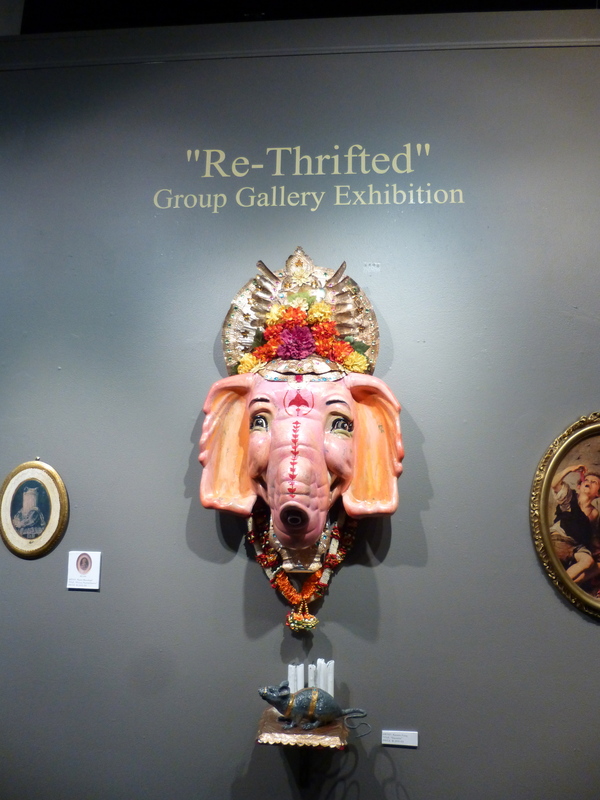 The Re-Thrifted Group Exhibit is on Display only Through November 3oth, 2013 at Sacred Gallery, Located at 424 Broadway, 2nd Floor (Between Howard and Canal Streets), so be sure to add it to your list of “Must See Art” while you can! 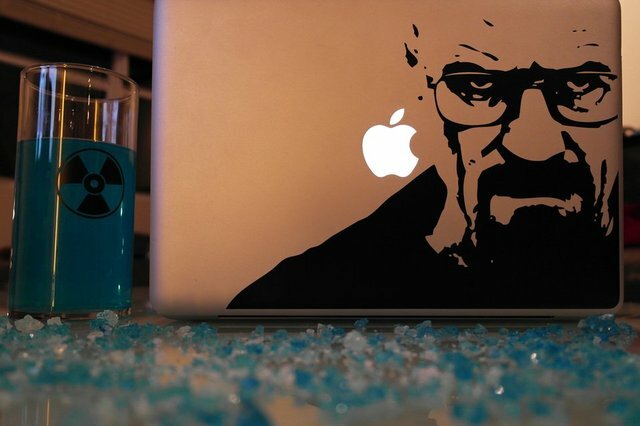 This rad decal of Walter White, everyone’s favorite renegade chemist, fits both 13″ and 15″ laptop designs. Available from The Fancy for just $12 at This Link! 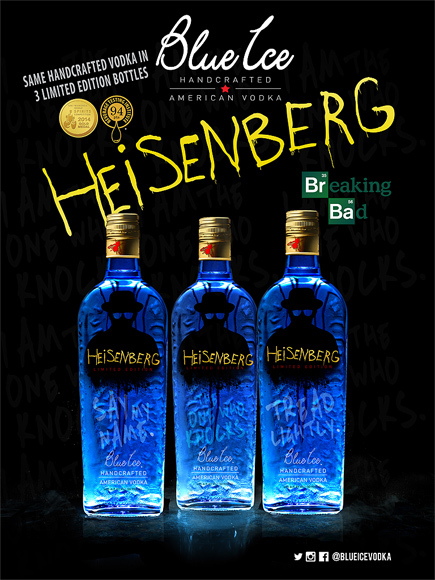 Just one more day of waiting until the beginning of the end: meaning the bittersweet final epsiodes of Breaking Bad, a TV show so amazing, it needs custom cocktails created it its honor! 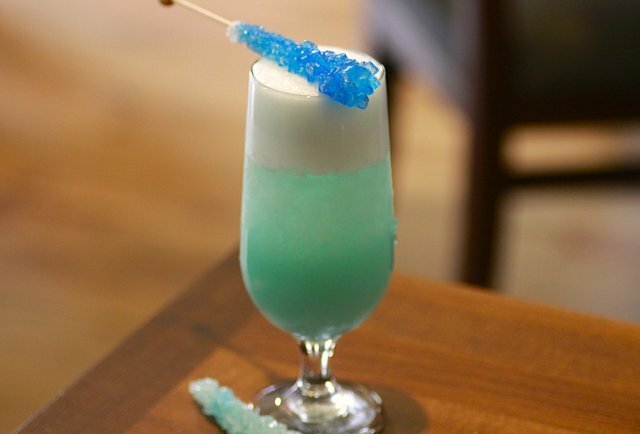 Thrillist Dot Com has posted a few intriguing recipes for potent potables — including The Blue Sky, The Mr. White and The Captain Cook — that you can shake up for your upcoming Breaking Bad viewing parties, as we drink our way to a very sad day. For a little crystal blue persuasion, just pour everything but the soda into a shaker (without ice), then jostle that sucker until the egg’s all foamy. When the chemical balance of cold and blue is complete, pour it into a glass, top it with crushed ice, then fill it with soda until the foam reaches the top. Garnish it with 99.1% pure blue rock candy. For additonal recipes and photos visit This Link! I am totally torn between extreme sadness and ecstatic delight that Breaking Bad will be starting its final episodes in just a few days. It is just the best show ever, and I will miss it terribly. In the meantime, how cute is this Calvin and Hobbes send up featuring Walt and Jesse on a comfy and stylish T Shirt? Want! This shirt comes in your choice of over a dozen colors, but I think the Royal Blue Looks best. 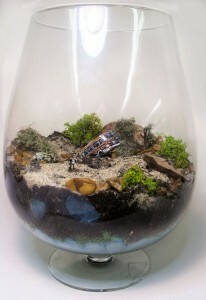 Sale Priced at just $14.95, buy yours now at This Link! 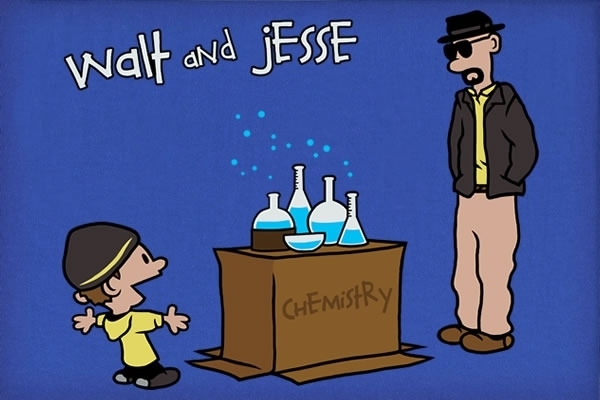 Are you as excited as I am for the premier of the final episodes of Breaking Bad? As much as I am dying to see what happens next on the Best Show Ever in the Universe of All Time, I am truly sad that the series will be ending after these eight episodes air. Sigh. 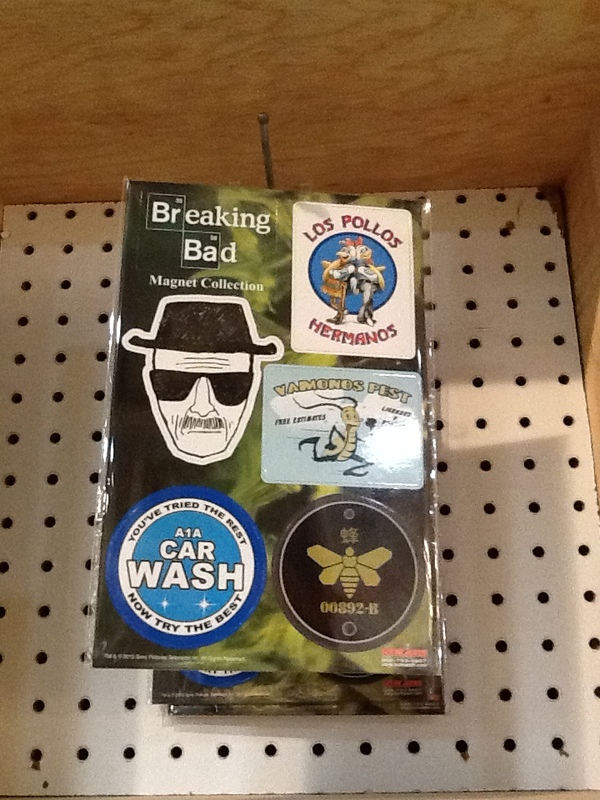 There is however a way to remember Breaking Bad always and forever, and that is with a set of awesome refrigerator magnets, which I saw on sale for $7 or 8 bucks at Urban Outfitters. You’re welcome. And don’t forget to tune into A&E on August 11th!